A few weeks ago, I shared with you some new rules at my house. Basically, for every piece that comes into my house, a piece of equal or larger size must go. 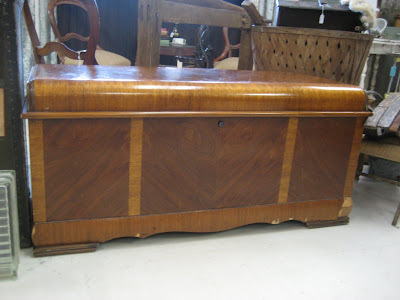 See this Lane Cedar Chest? The history goes back to 1950 when my Great Aunt Birt and Uncle Otis gave it to my Cousin Janelle for her high school graduation. I can prove this, as the paperwork is still in the chest. Long story short, it came to live with me in the early 90's when I graduated from college. It has stored my quilts for years. I've enjoyed it. The issue? There was a great blanket box in my store that I thought would look better in my house. So? The blanket box is now at the foot of my bed and this family heirloom is for sale at Primitiques. Kinda weird, letting go. 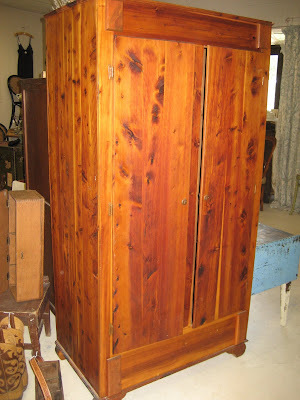 Now, check out this cedar closet. My grandfather's. It was in my office for years. I had a book shelf inside of it, and the piece has served me well. Remember those primitive file cabinets I mentioned a couple days ago? Now you see why this had to go. Letting this go is weird. Primitives. Have you been with me long enough to know that I do love me some primitives? And Oak. Oak is a big favorite. Well, I picked up an oak dresser a few weeks ago off craigslist. It now rests beautifully in my bedroom. Remember the rule? Something of equal size had to go. 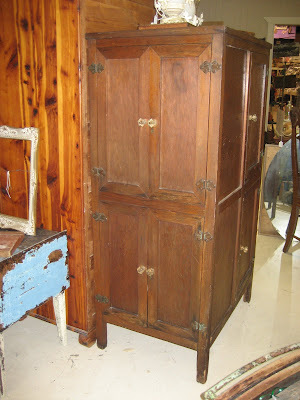 Check out this primitive cabinet that has tear stains on it. My tear stains! Yes, those are great hinges and door pulls. Look at those pictures. There are doors on the front and doors on the side. This piece almost made me cry the first time I saw it. It was so primitive. It was so me! It's not a family heirloom, but, I think letting it go hurts the most. Awwwww! I'm so proud of you, honey! Very insirational post Mindy. I'm sorry you must part with family pieces however I'm sure your loved ones would agree with what you are doing. Mindy, I absolutely love your blog, just wish I lived closer to enjoy your store more. We have not created your rule yet in our house,, as I still have 5 rooms in the basement to fill first. That was so sad...I almost shed a tear. Gotta hate to see great things go, but I understand there's only so much space in a house. Comfort yourself with the fact that someone else will love your pieces and they will still be treasures to someone. Hi over there in Texas from Memphis! I was so happy to have found your wonderful site (thanks to Robo Lady!) I look forward to checking in quite often and getting some wonderful ideas. Keep up the good work! 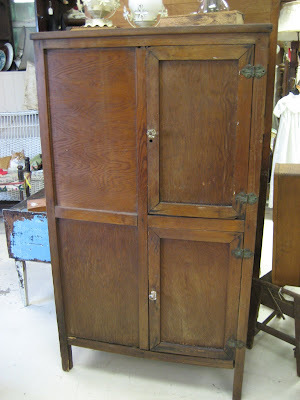 Thanks and happy blogging and junkin'!